Manufacturer: S. W. CARD MFG. CO.
Offering this quality set of good clean sharp useable taps in their original wood box with wood dividers and sliding top. The box top is marked "S. W. CARD MAN'F'G. CO. MANSFIELD MASS." and the taps are marked S. W. CARD MFG. CO. MANSFIELD MASS. 5/8 11 U.S. STD." 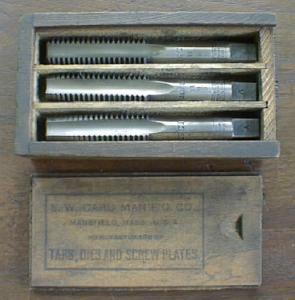 These are very hard to find machinist disposable tools in their original box-joint corners wood case. The taps are in very good shape, clean and sharp, the box is solid and in very good condition as well, and has protected the taps since before 1908 when Card sold out to another company. Don't miss out!